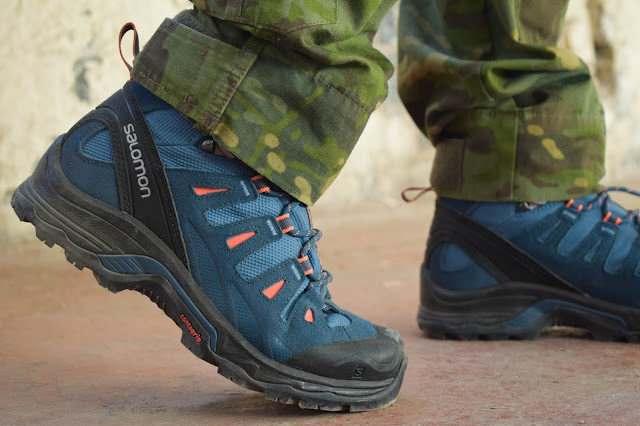 I’m back with another review, and this time I’m going to be looking at footwear for airsoft and reviewing the Quest Prime GTX W’s by one of the most well-known brands in airsoft - Salomon. 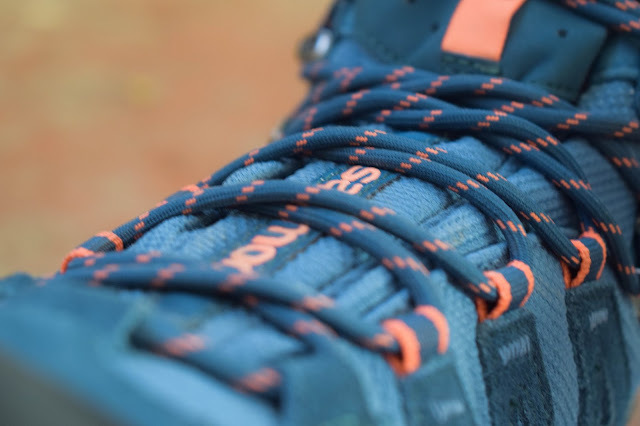 Salomon has a great reputation amongst airsofters for being comfy, durable and waterproof footwear that have the grip and ankle support to support the nature of the sport, but are they all they’re cracked up to be? The Quest Prime GTX women’s is an athletic style shoe by Salomon that is designed for hiking and backpacking. The design focuses on being lightweight and comfortable whilst still protecting the feet from the terrain and the elements! Let’s first chat about the specs, and we’ll start with the outer sole! The outer sole has High Traction Contagrip meaning you get an excellent grip even in tough terrain. 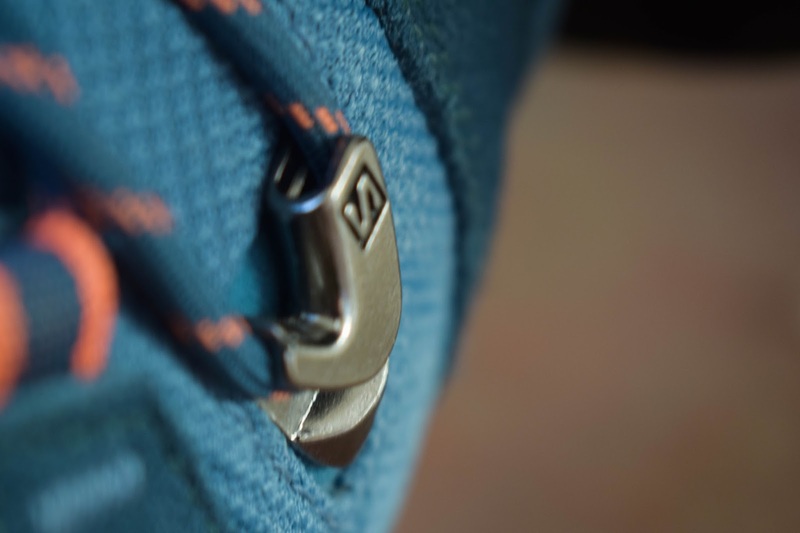 The midsole comprises of injected EVA which is lightweight and absorbs shock well and a moulded shank which helps the sole keep its shape and support the arch of your foot. The Quest Prime GTX’s also have the advanced chassis – this is placed between the outer sole and midsole that maximizes motion control, energy management and protection for stable and comfortable use. 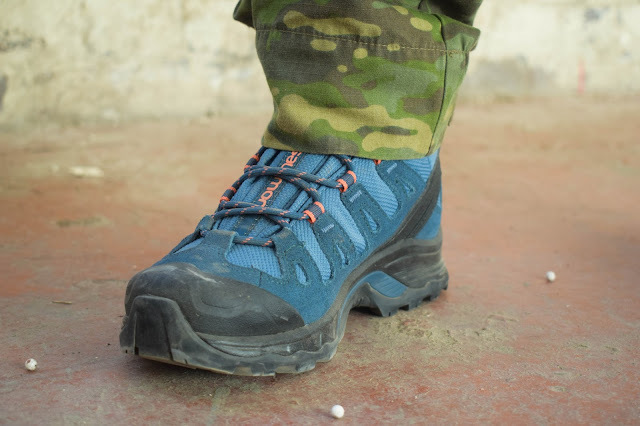 The outer membrane of the boot is made of GORE-TEX, GORE-TEX is a material that gives you unparalleled breathability but is waterproof so it keeps your feet from getting wet! Overall, the specs/features are bang on. 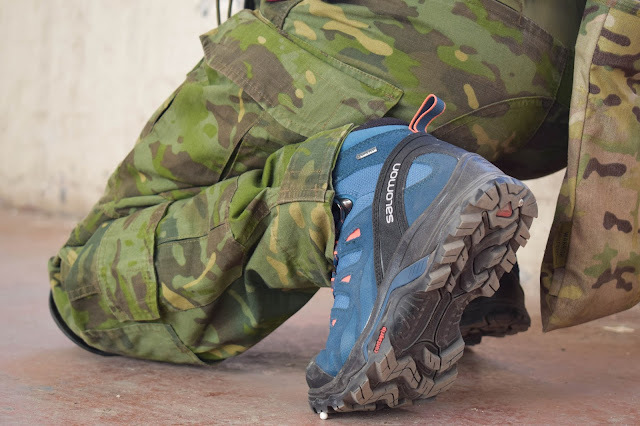 When I got them out of the box I was quite taken aback by the colour of the shoe – instead of black they were to my surprise a bright blue, which isn’t the most tactical colour but when paired with my MultiCam Tropic combats it didn’t look too bad. I did see in some of the reviews online that the shoes run wide and were uncomfortable until broken in, but I typically wear either a 4 or 4.5 however for these I went for a size 5 as I wanted them to be a little roomier so I could layer the socks on in the winter time and I didn’t find them to run wide. They fit comfortably across my instep (top of foot), clung well to my heels and didn’t move around too much on my feet – they felt secure. 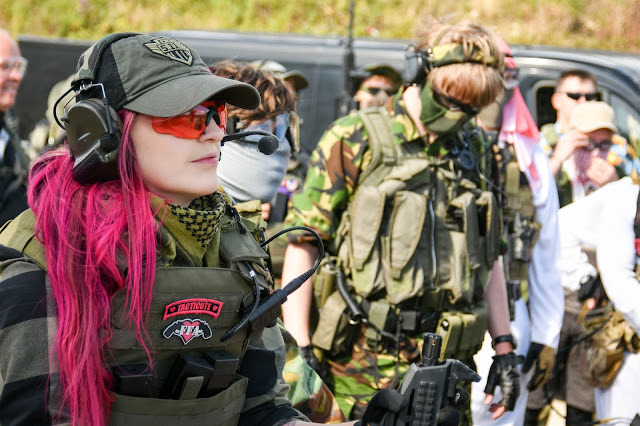 When I first put them on, I wore them for around 8-9 hours in total at an indoor CQB site for a regular skirmish day and whilst they were stiff for the first few hours, I wouldn’t say they were uncomfortable. The heat of your feet will naturally soften the material of the shoes so after a couple of hours you can feel them loosening off. The grip was fantastic even in the parts of the site that had leaks. The sole manipulated relatively easily so they were a comfy pair to wear all day – my feet didn’t hurt and they weren’t sweaty thanks to the GORE-TEX technology. I haven’t quite gotten round to field testing them for waterproofing as of yet but someone spilling a whole mug of tea on your feet and them remaining dry is promising! 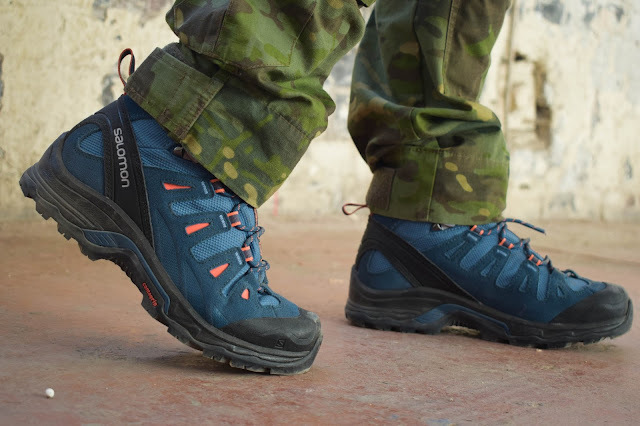 The Salomon Quest Prime GTX W’s boots retail for £140.00 which is a serious investment but they are without a doubt one of the comfiest pairs of shoes that I have ever worn. They are available in 3 colourways – grey/mint green, black/purple and the colour option that was sent to me the blue/orange. The colourway I received isn’t the most tactical colour, but it is fun, and you’d be hard-pressed to lose them!